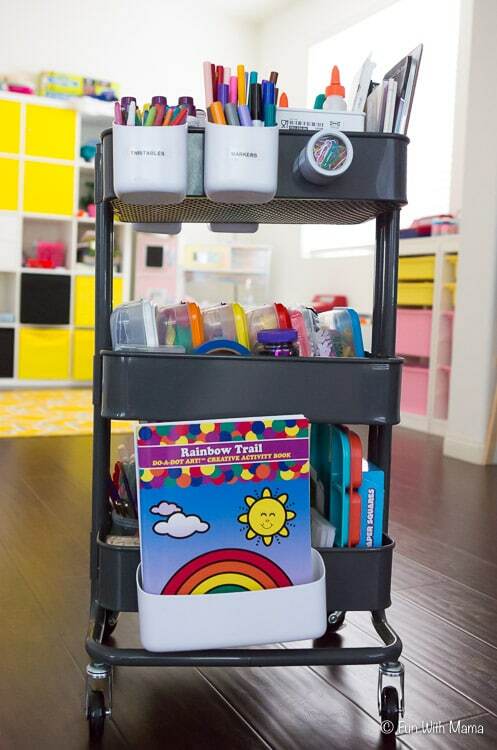 One of the best ways to organize kids art supplies is to create a Kids Art Cart with the Ikea Raskog Utility Cart. 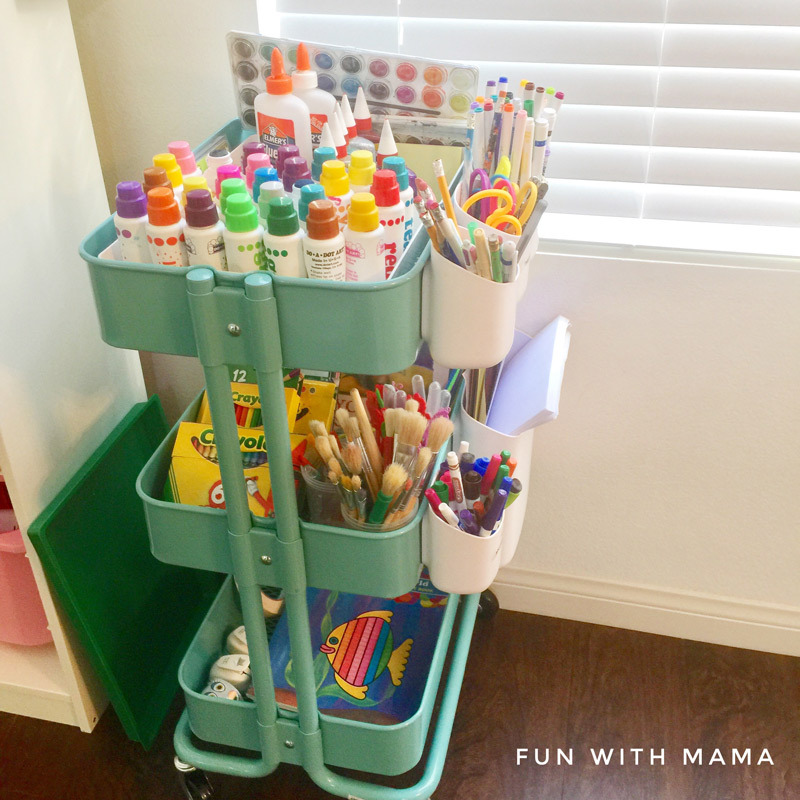 I love that this DIY Ikea Art Cart created with the Ikea Raskog Cart fosters open ended creativity in children and allows them to use their imagination and creativity whenever the mood arises. I wanted to organize our kids art supplies in a way that allowed them to be accessible to the kids while also looking neat and organized.The Ikea Rastog utility cart was the PERFECT solution that enabled us to create a DIY art cart! I posted a picture of our art cart on Instagram to share with my followers and I was BLOWN away by the response I received. 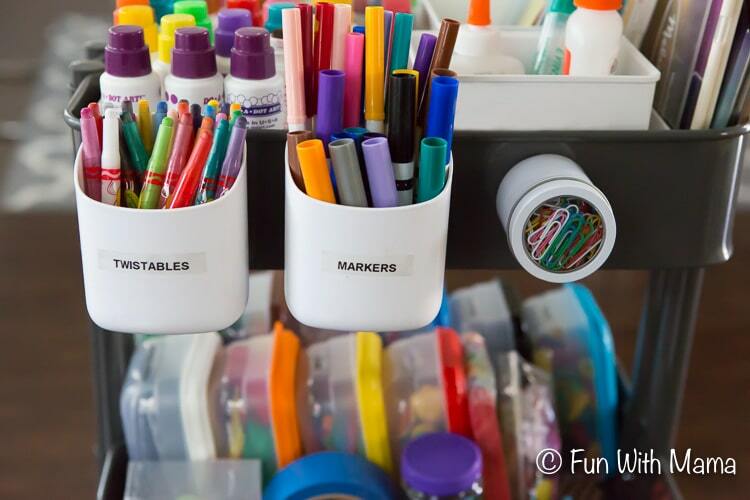 I guess many of us are struggling with how to organize kids markers, crayons and art materials. 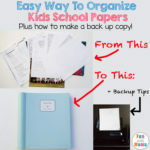 I figured out an easy way to organize kids school papers and I am extremely happy on my playroom organization, check it out at how to organize a kids playroom. I realize the importance of organization skills when it comes to being a mother. The Kids Watch Less TV – I find that by leaving these kids art materials out at all times it helps the kids watch less tv because colorful art supplies tend to be eye catching and more inviting. It is a kids boredom buster – The next time your kids are bored tell them to look at the Art Cart and see what activity they can come up with. It is great for Open Ended Art – The kids are more prone to explore their artistic and creative side by doing more arts and crafts. Our art supplies and materials actually get used. – I can’t be the only parent who purchased art supplies, markers, and crayons and then stored it in a closet where it never got used. By organizing and leaving the collage material out things definitely get used. 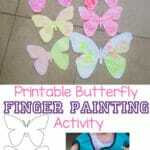 It is very convenient – We do bi-weekly printable letter crafts that utilize many of our arts and crafts materials. It would be such a hassle to have to take out each item from a closet. By having it all laid out like this my 3 year old daughter can collect the material that is required for each activity. This art cart is used constantly during our toddler activities , preschool activities and especially when we are doing arts and crafts. 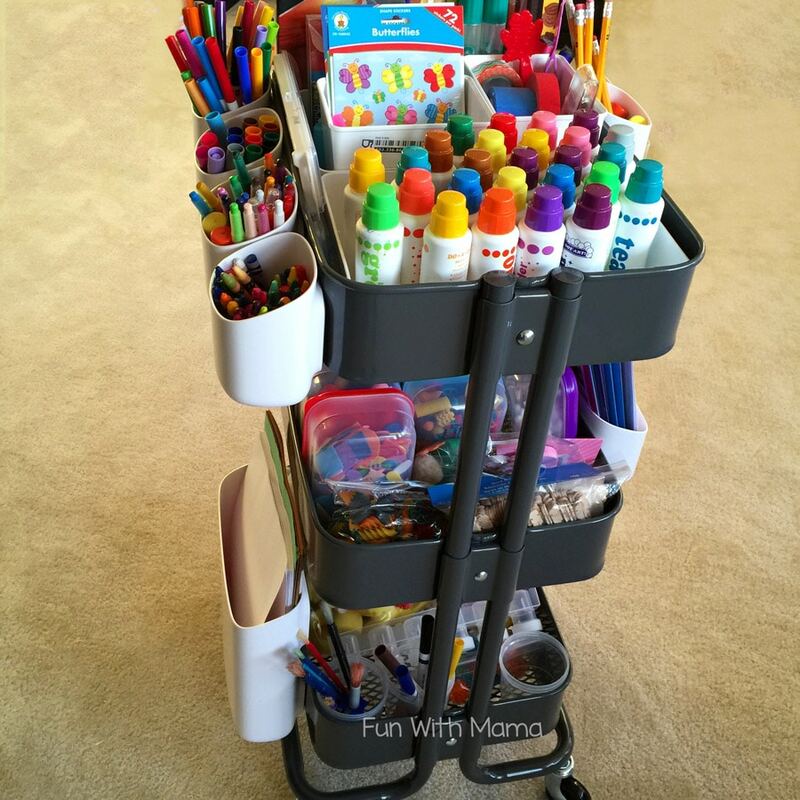 The fact that it is a rolling art cart means we can move it to wherever we are working makes it a wonderful homework supply organizer too. If I didn’t have a 3 year old I would place paint bottles in the bottom tier to create an even more artistic conducive environment. For now, those colorful bottles live in a cabinet far from the reach of tiny little hands. It is no secret that I’m an organizing junkie. I love looking at pretty organization pictures online and pinning these organization ideas to my Pinterest account. I’ve already posted about how I organized our girls hair supplies , and a look into our playroom. My latest organization accomplishment was finding a way to organize my daughters cutting skills materials. I created a printable preschool cutting busy box for this. It is beautifully organized and colorfully inviting. The first one goes into more details about the containers we are using. The second one is a quick update to show you how I have changed up the materials and what is currently in it. We rotate our art cart the same way we rotate toys. 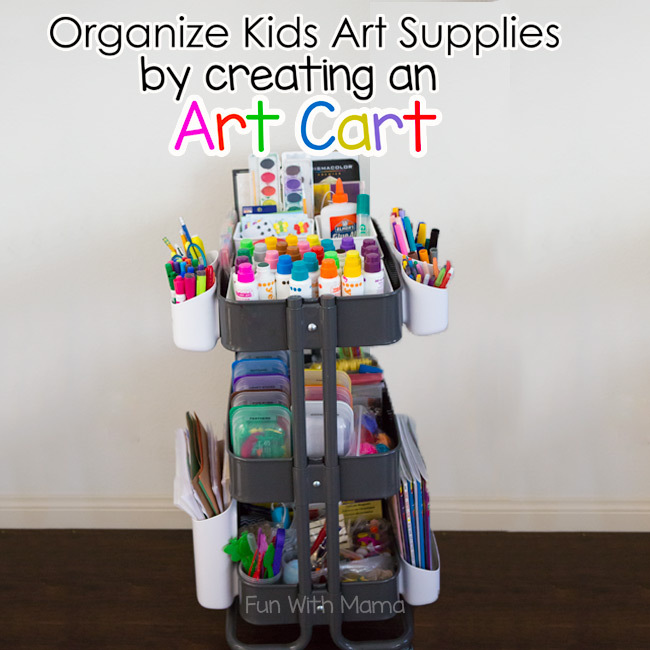 How to create a Kids Art Cart? If you do a lot of kids crafts and kids activities then somehow this helps prevent my markers from drying out when the kids leave the marker lids off. My kids feel they have to be more ‘responsible’. Yep, don’t ask me how that works in my house, but it somehow does. Maybe its because we worked out this system as a family. The kids gave me input on how they wanted it and let me know which supplies they use the most. It is important to note that our art cart adjusts with the seasons and my kids interests. For now, these are the items that are in our art cart. Please note that this post may contain affiliate links to our favorite products. Raskog Utility Cart – We are using this Ikea Raskog Cart in Grey and I recently purchased the I absolutely love the turquoise one too. It looks so colorful and pretty. I am now using the turquoise one in the children’s playroom and the grey one for myself. Containers and storage cups – look around your house to see what you have that can serve this purpose. You can also find the beige cart on Amazon as well as the black one too. I’ve had SO many questions about the containers on the side. 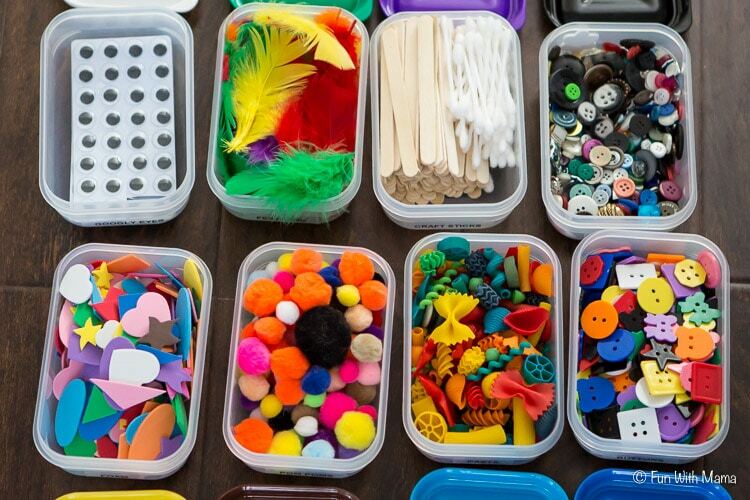 These containers seriously transform our art cart into something even MORE magical! The containers on the sides are the Urbio Perch Bitsy Magnetic Container in white , the new teal one is gorgeous Bitsy Magnetic Container , and the Biggy Magnetic Container . They have the Biggy in teal as well Teal Biggy Magnetic Container . You can use the magnetic wall piece on your wall and art area if you do not have a cart. I LOVE this product. The Perch^ Mini Wally is also a great addition to an art table. 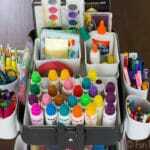 On the top tier of the craft art cart you should include items that your kids use the most. It has the best access and is the most inviting point to the kids. I put the following items in ours. Please remember that this will differ by family and you definitely don’t need everything here. Pick and choose a few items and build it up with time. 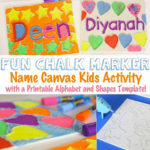 – Washable Markers- the 12 Pack or the 40 pack for younger kids we love the pip squeak markers. – Scissors (for older kids). We use these scissors for our 3 year old and these for our older kids. – Watercolor paints (this is not too messy and is a wonderful individual activity for a child. – Any stickers will do. This is what is in the second tier. They are all in labeled containers. These are the containers I have and absolutely love! I labeled the containers using this label maker and tape. On 1 of the side containers I have : construction paper, lined paper, cardstock and plain white printer paper. On the bottom tier: I have things that I don’t want the little one to be as accessible to. Because I use the big containers on the sides, there isn’t very good access to this shelf. If you have nothing on the sides I would suggest you add the coloring books to the bottom tier. Since I needed ample space I didn’t do this. In the front I store our fine motor scoopers, pipettes, and paint brushes. In the back I have our low temp glue gun, random extras. 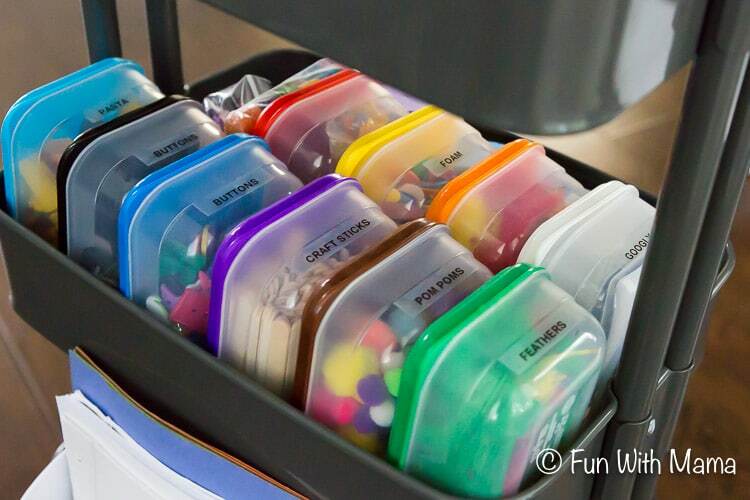 For older kids I would suggestion you get one magnetic container and fill it with the supplies they need for homework. For example, pencils, erasers, scissors, and a glue stick. Then label it with their name. When the child needs it they can easily grab it from the art cart and take it to their homework area. Our art cart is always changing and adapting. This is the beauty of open ended art. If you are looking for art themed books that show your child that it is okay to make mistakes (like when a marker or paint drop spills) then definitely check out the books below. My favorite of these is, Beautiful Oops! For More Creative Ideas Please Join Fun With Mama’s Newsletter. We are always looking for the best organization ideas as I feel it makes a big difference for us mentally and physically. I figured out an easy way to organize kids school stuff and create a backup copy of the kids important documents. 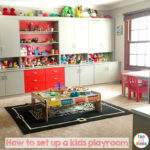 I have also shown you how to set up a kids playroom with some amazing organization tips! Check them out if your an organization junkie like me! 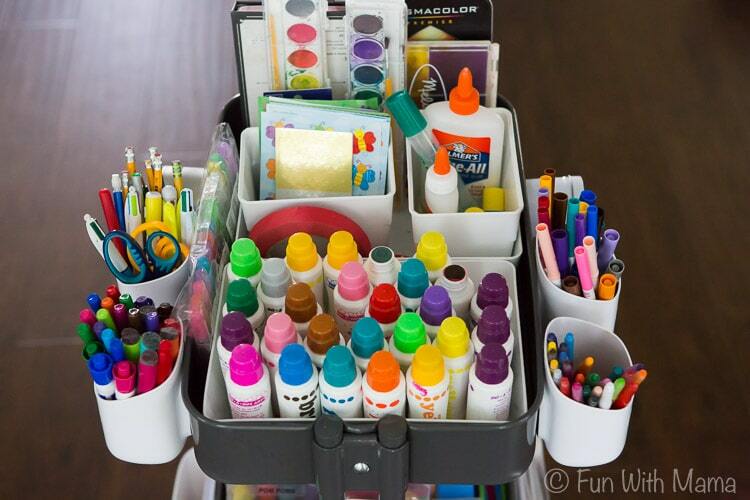 Looking for projects for older kids that we have done using this art cart? I personally loved this Paper Plates Shapes Sewing Activity. 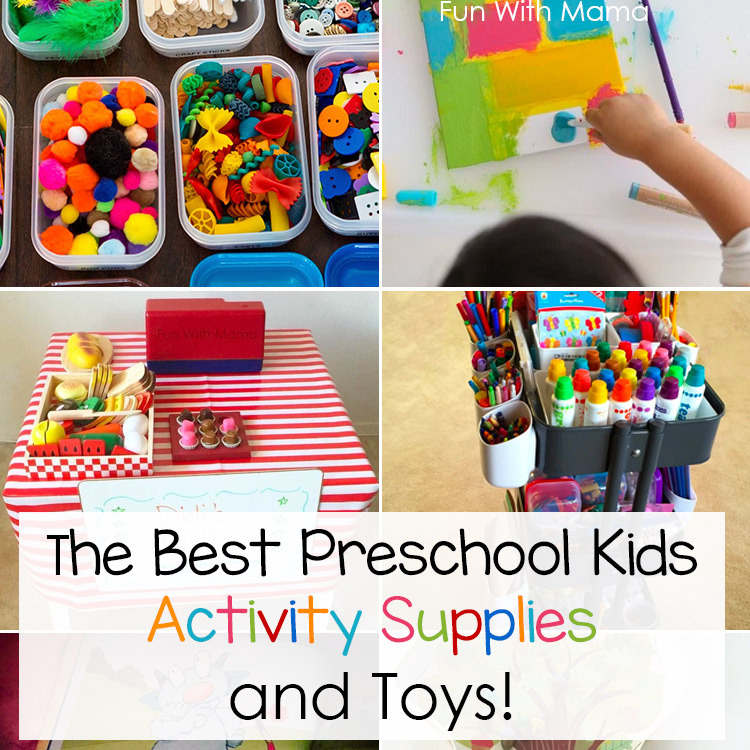 Looking for the Best Preschool Kids Activity Supplies and Toys? Then you definitely have to check out this post. I love you washi tape and paint activity. 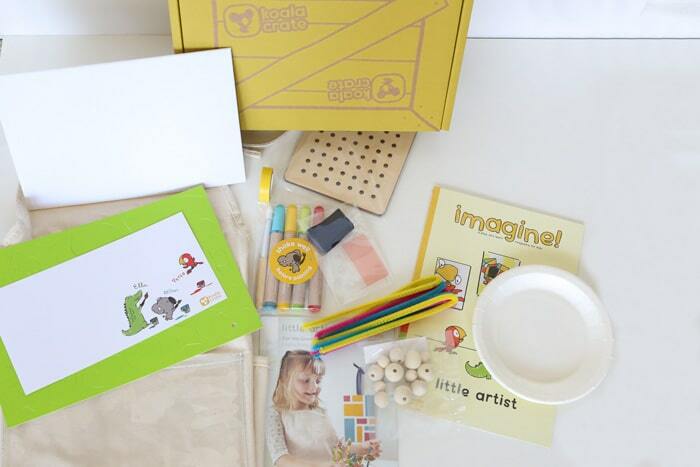 These Shapes Activities are also a lot of fun and this Preschool Cutting Busy Box is very popular. Art Cart Ideas from Tinkerlab – I read her book and was inspired to create my own art cart like the one you see her. 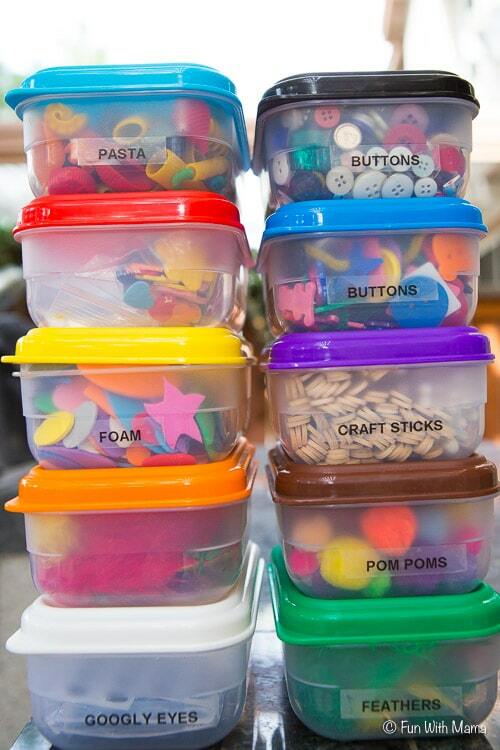 Love this idea for art supply storage. 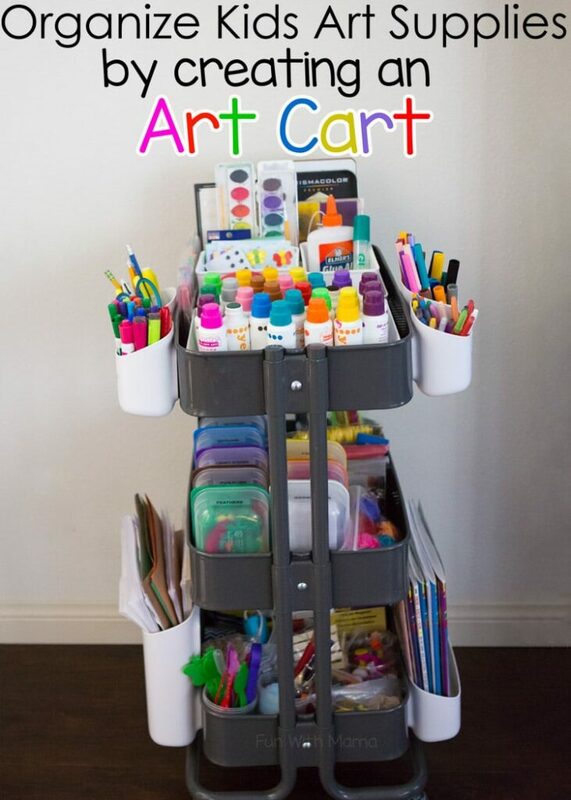 Although I don’t have children at home nor even as regular visitors, I am planning to do something similar with my own art supplies, as the cart is far better than what I currently use. Really nice, been looking for an excuse to buy at least one of these, so thanks! And thanks for sharing on craft schooling Sunday! Hi, I just love your art cart. The dark grey one is ideal. How can I order one and how much? I live in Durbanville, Western Cape, South Africa. 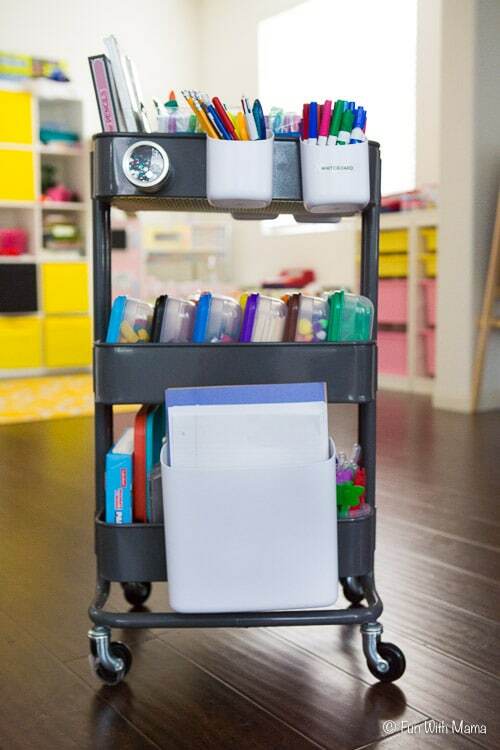 I bought three of these carts for tutoring supplies, but I think I’ll turn one into an art cart. Great idea and wonderful photos showing how to use it. Now I’m thinking one for Legos might be useful. But we have sooooo many Legos! !